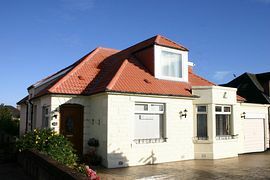 Thistle Dhu Bed and Breakfast Edinburgh, is a 3 star comfortable, non-smoking detached family bungalow, conveniently located on the main A8, four miles from Edinburgh city Centre and two miles from Edinburgh Airport, Ingliston and a few minutes from Edinburgh Zoo. Your hostess Mrs Margaret Simson, provides traditional Scottish Bed and Breakfast in a relaxed setting with en-suite rooms. Thistle Dhu, has it's own private and off-street parking, plus a lovely spacious garden to the rear, with a large conservatory, where you can relax and have tea or coffee at your leisure. There are plenty of local restaurants and bars and the accommodation benefits from being on a main bus route, which provides a frequent service to Edinburgh city centre. The Gyle Shopping Centre, is ideally situated only 5 minutes away, where there is a range of over 50 shops, with everything from Next to Marks and Spencer. Special Diets Provision: Special diets are catered for. Please state special diet when booking. Follow the signs for Edinburgh City Centre and we are just past the Gogar round-about on the left hand side. From: £30.00 per person per night.